Hmmm...it's not a pumpkin...maybe the crossed lines and the single sesame seed represent a goldfish? I can't tell! Does it represent the rice harvest?? hashi goma? (chopsticks sesame seed) ok, i totally made that up. :) something that popped right into my head as soon as i saw this is absolutely not japanese. but this reminds me of hot cross buns. do they have those at the bakeries in japan? Alright - I don't know, but I have some ideas that aren't guesses. This is the correct time for 'hatsugari' ("first goose", as in "we see the geese in the sky, k=just now starting to migrate"). The curved brands are similar some other incarnations of hatsugari (imagine those brands on senbei, for example). 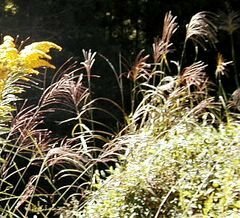 "Withering autumn grasses" would also be a seasonally-appropriate theme, though one imagines that the orientation would be a bit different. but it looks quite tasty, whatever it is. Amy is right. It's the rice harvest. Those slashes represent sheafs of rice bound for cutting and threshing. Do you celebrate mooncake festival or lantern festival in Japan? Perhaps it's a autumn moon theme thingy? It looks like chopsticks and black sesame seed to me too. I think it is called Autumn Harvest. Thank you for guessing, everyone! :D I truly enjoyed reading your creative and poetic answers, and I'm sure all the readers of this post did, too. Now that the answer was posted, what do you think of the name of this wagashi? 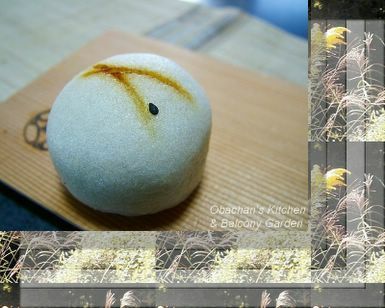 Maybe you guessed that the lines are susuki (Japanese silver grass) and the shape of this manju represents the moon? Good guess! It’s a nice try. The two lines do look like chopsticks. It sure is the time for hatsukari. Thanks for the poetic guess. Actually your guess of “autumn grasses” was partly correct. Oh, one more vote for chopsticks. ;) Also, bird is a good guess, too. Yeah, I can see why this looks like a pebble. Good try. Mmmmm… good guess. I’m happy to hear from someone who is familiar with the rice harvest. In my hometown, which is one of the super-rural areas in this prefecture, harvesting rice was part of the extra-curriculum activities at the junior high school there. Yep, we do celebrate moon festival, but instead of mooncakes, we eat dumplings. I’m planning to post about or moon viewing custom… on October 6th. Oh, it’s this coming Friday, isn’t it? Goodness, you guys are just so creative ok... And meticulous. Sigh... I wanna stay in Japan and experience this myself. Thank you so much for doing this and sharing with us readers about the wonderful cultures you have in Japan. yeah, hot cross buns can be quite tasty :) the ones at the local bakery here look almost exactly like your wagashi, rounded with an X on top. very beautiful name for the wagashi! it certainly evokes the autumn season. subarashiii! Thanks. In fact I was (still am) very curious about how people, especially Westerners, would react to the combination of "insect" and sweets. That is why I chose this wagashi for this month's entry and made a quiz out of it. Aw, I miss the lovely bell insects of Japan... I remember them so well from my time there. The wagashi looks very tasty.